Making Progress and a New Quilt! The sewing room cleaned up is still in progress. Will it ever end? I'm going to the store to get some organization supplies. Seems like the old way of doing things isn't working anymore. While all of that is going on, I must keep working on new stuff, and I'm all ready to dive into a new project. It's always so exciting, isn't it? If it weren't, I suppose we wouldn't have so many UFO's! I have been waiting for just the right project to come along to use the awesome fabric on the left. It will be the border. All I have is a fat quarter. What in the world was I thinking only buying a fat quarter? OMG! The quilt is small....only about 20 inches finished, and because it's a directional fabric, I don't have enough for straight cuts (for want of a 3.5 inch strip. Sigh.) So...I'll "make-do" and piece where I have to. 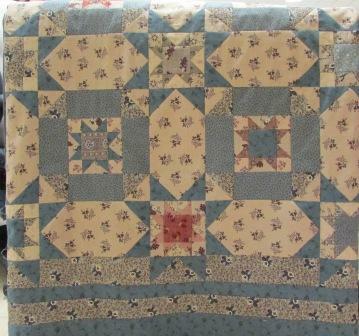 Split seams are the most common type of make-do.....narry every antique quilt has them. 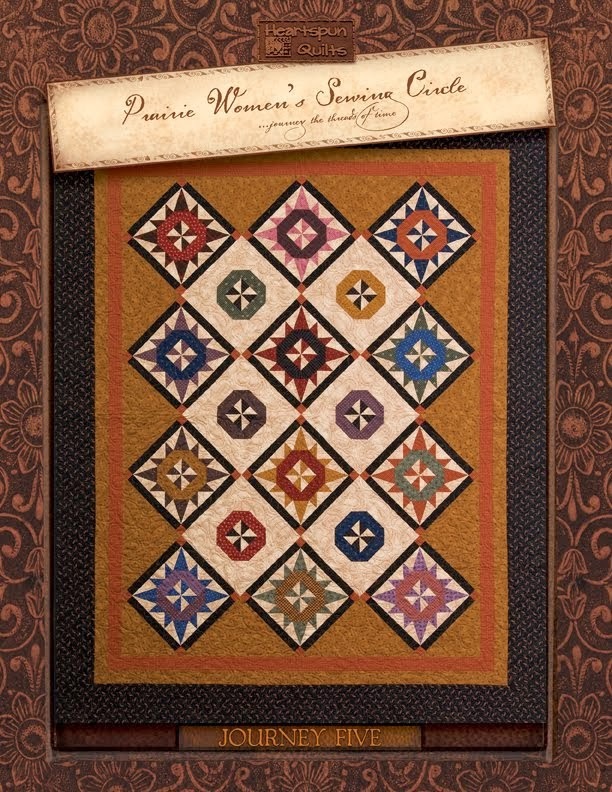 I'll be honoring our quilting heritage! I'm pretty sure the light print on the right will be "the one". Still not 100% sure, but I'll audition it on my design wall for a day or two (while I keep sorting and purging!) The fabrics appear a bit washed out from the saturated, luscious colors they really are. I'm certain it's not the camera, but the photographer. I'm woefully inept with capturing the look I really want. Maybe in another life, I'll learn how to take a decent photo! This yet unnamed quilt is for Journey Five. I'll post progress. The Pin Money and Prairie Wovens & Dobbies sample yardage should be arriving soon, so we'll be in full sewing mode here. Better finish the sewing room!! In the meantime.....I thought you'd a enjoy more 1800's trivia! 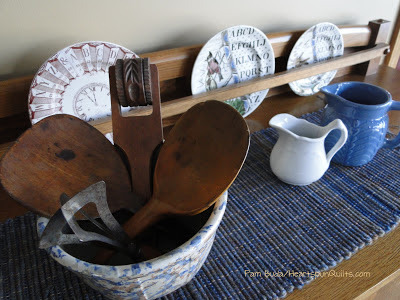 One of my favorite antique collectibles are butter molds. There's something so domestic and dear about them. Butter molds were used mostly in the 17th & 18th centuries at a time when the only way to have butter was to churn it yourself. (1762 is the earliest documented date for a butter mold in America.) 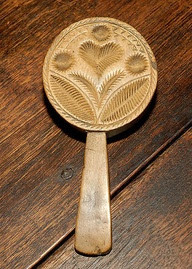 Women churned and packed butter to sell for extra money, and the butter molds served not only as a unit of measure, but imprinted the butter with a design that would identifying her butter from the rest. A brand, if you will. 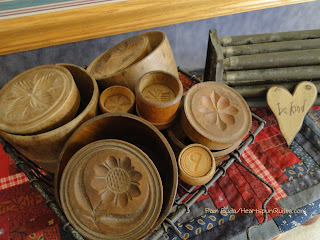 They are truly folk art as they were carved by hand, usually from maple because maple held up very well to all the use and washing. They came in a variety of shapes and sizes.....some quite crude with no design, and others beautiful works of art! The outer shell, the stamp or die design, and the plunger. Butter molds allowed the butter to be free-standing, served as a measure forming the correct amount of butter. The plunger pressed the stamp onto the top of the butter and pushed the butter from the shell. But it's the stamp design that makes these treen wonders so collectible! As you can see in the photos, every kind of motif, flora, fauna, bird and farm animal was depicted on butter stamps. This rare, lovely design with the word 'Union' is one of the best I've ever seen. Once the butter was ready, the inside of the mold was dusted with flour. It was packed very tightly inside of the shell. Butter paddles helped immensely with this task as you wouldn't want any air or liquid trapped inside your butter lest it turn rancid. When the butter was firmly packed, it was ejected from the mold and wrapped in wet muslin, ready to take to the market. Not all butters were alike! If your butter was exceptional (or not! ), the design of your stamp quickly identified your butter from the rest, an artful and easy way if identification. 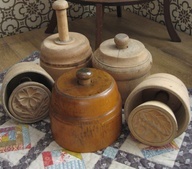 The butter molds at the right are from my collection. I look for a design I like, and a wonderful patina to the wood. The smaller, butter pat molds are harder to find, and of course, more expensive. I was very lucky to find the pat mold with my initial several years ago, which is fun. When I hold a butter mold, I can't help but feel the wear, to be linked to the hands of the woman who used this wonderful piece to package and market her butter. Who carved the wood and stamp design? Did they have any clue what a beautiful piece of art they were creating? I recently discovered "lollipop" butter stamps. They, too, come in a wide variety of design motifs. I hope to find one or two to add to my collection! I hope you've enjoyed this bit of 1800's trivia. What kind of American Folk Art do you collect? I know there's a lot of kindred spirits like me out there, collecting and caring for these pieces for our lifetime. And...it's my pleasure to do so! Last week, I finished a project that Deb and I have been working on since last summer.... not continuously, but here and there in between projects. You know the J O Y that comes when you sew that last seam?!! I'd love to show you, but it must remain a secret for now. Hoping it won't be too long until I can share it with ya! In the mean time, the creative mess that is my sewing room has got to go. I can no longer stand it, so over the weekend, I began the sorting, folding and pitching. I don't mind the mess while I'm working on a project (well, I do, but I've learned to ignore it!). Afterward...I've got to get organized. It's like erasing the chalk board in my head, allowing me to begin anew. 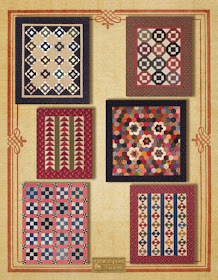 I already have fabrics on the design wall for the next quilt, a Journey Five quilt, and will share the progress as I go this week. In the meantime, I have a wonderful recipe to share with you. This recipe came to me by way of Jeanne Horton of The Country Sampler quilt shop. She posted it on her blog a long time ago. I printed it shoved it in a file folder to make "someday". Well....I'm so sorry I waited so long!! This is the most delicious frosting recipe I've ever had. It's really easy to make and absolutely over-the-moon delicious. 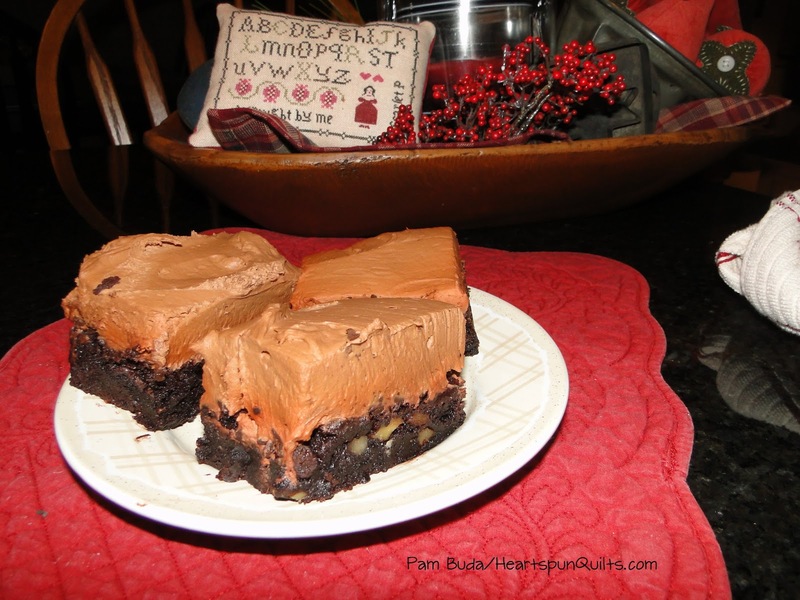 I topped it on a batch of brownies, and would be wonderful on a cake or cupcakes....anything. My kids thought it was just fine to eat in a bowl all by itself!! Click here for the recipe. Hope you're doing something fun today! This is one of those weeks where there's just nothing fun or interesting to report. I think about posting on the blog and wonder what I should say? That I have orders to fill (gratefully, but not post material! ), that I've finished my Spinning Wheel quilt and delivered it to my friend Ronda to quilt (yawn), that I'm writing several patterns and rechecking math (oh, come on! ), and that I'm doing laundry? I probably lost ya with that one, didn't I? Yes...the glamorous life I lead!! This is a Tiramisu Cupcake. Did I say it was divine? Heavenly? Delicious? It was very easy to make....really easy! Not that it wasn't a bit of work, but all in all, easy breezy. It tasted like a restaurant pastry chef would have made it. I even whipped out the 'ol pastry bag to swirl the whipped cream on top. Last Saturday night, I had my neighbors over for dessert. We live in a cul de sac, and we've gone out to dinner with these folks once a month for the last 18 years. Needless to say, we have the best neighbors! After dinner, we enjoy dessert and conversation (we take turns hosting). They loved this cupcake and wanted the recipe. Perhaps you'd like the recipe, too? I found it on Pinterest. 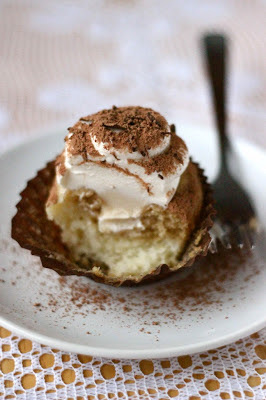 Click here for a bite of heaven! I sure hope I have more interesting stuff to report to you in my next post, or I'll be doing a lot of baking! Truth be told, I had been trying to think of a name with the word "reel" in it because of the center block, but nothing came to mind. Somehow, it does remind me of the smaller types of spinning wheels nineteenth century "Prairie Women" used. Hhhmmmm.....yes....it's growing on me. What do you think? Well...I see I didn't crop the photo straight. Sigh....please forgive. 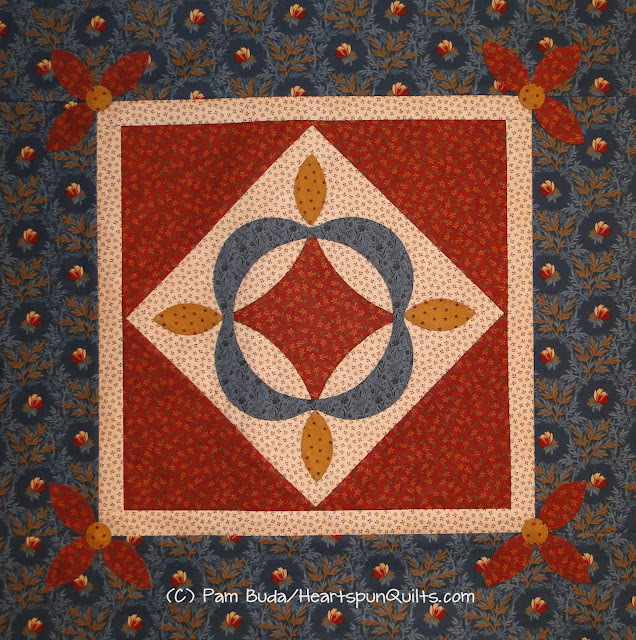 I adore the blue border fabric and it was such fun making this quilt. I chose to use an alternate blue fabric in the reel block because the border fabric didn't show well, but you may not have to use an alternate depending on your border print. 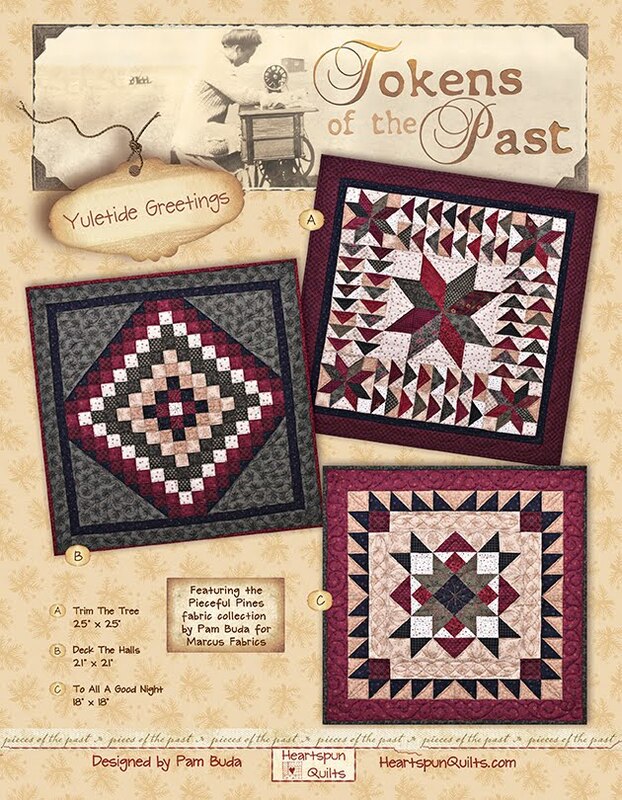 I have used larger print fabrics in reel blocks before and it looks wonderful! 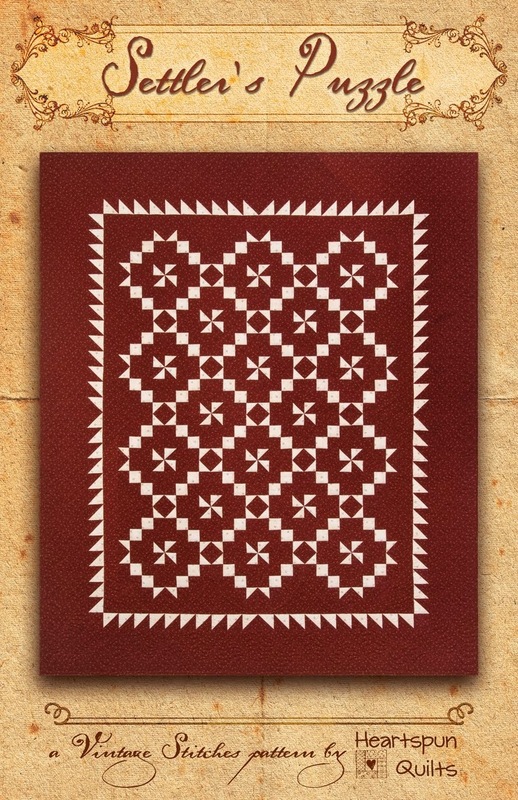 I also ruminated quite a bit over whether to use the gold or the red for the border "leaves". I auditioned both, and the gold drew too much attention (in MHO) from the border print, so I went with the red which was more subtle. No right or wrong there...just my opinion. I am loving the red print with its bits of gold and green. It was fun, and everything you hope when making a quilt. A pleasure from beginning to end. Now....it needs its label, backing and batting, then off to Ronda's to be quilted. The pattern should be ready in April....so stay tuned. 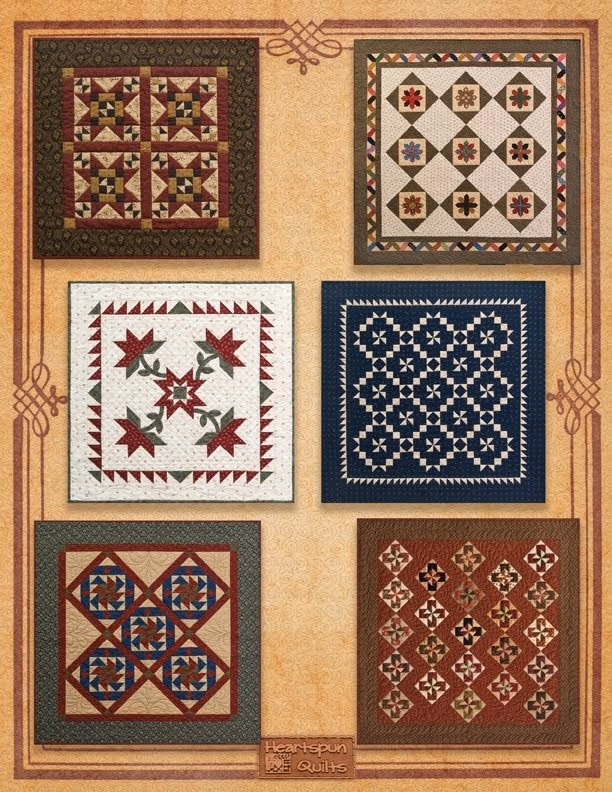 "Airing of the Quilts" (aka show-n-tell) in April. So...please email a photo of your Orphans & Scraps Sew-along project. It does not have to be quilted or bound!! Please send the photo to Pam@HeartspunQuilts.com, by April 1st, along with your first name, and the state/country where you live. There's still time to participate! 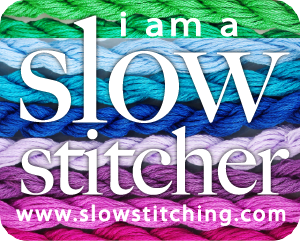 Click here to go to the beginning of the sew-along. I ultimately went with the lighter red print. It has a bit of the gold and brought in some green which is also in the background print. I don't get to applique very often, and I so enjoy it! This technique produces the exact look and feel of needle-turn, which I love, because the applique's remain soft and pliable. I'll have it finished today and post the end results so you can see how it all turned out. Also....the Blooming Hexagon Pincushion patterns are back in stock on my website. 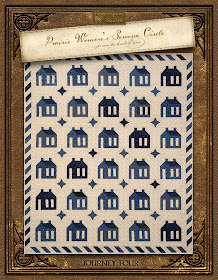 The pattern includes full color instructions, the hexie papers, and the vintage zinc jar lid. Click here to see more about it! I've been working on a new pattern. Geesh...it feels so good to be sewing because it seems like I do much more paper work than working with fabric! This little quilt has a bit of applique in it....just a touch. I've been thinking about this project for many months now, and... finally....I get to make it. The quilt is called Cottonseeds, and here are the fabrics I've pulled so far. I'm madly in love with the blue floral print (Vicksburg by Judie Rothermel for Marcus Fabrics). I found it at Back Door Quilts when I went there several months ago. They only had one yard left, and oh....how I wish I had much more!! Anyway...the yard will be fine for my little quilt. I have to decide which red to use. Hhmmm. I'll have to play a bit more...audition them, if you will. Which red gets your vote? 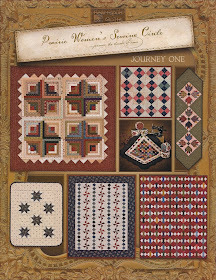 I will be teaching this project when I visit the Lodi Valley Quilt Guild in Lodi, Wisconsin in April. This will be a return visit for me, and I'm delighted to go back to spend time with this delightful group of ladies!! I'll post my progress this week as I work on the quilt. On a side note....at the start of the new year, I posted that two of my goals this year were to learn to make wonderful pies, and great yummy soups. Well....haven't delved into the pies just yet, but I have made a few soups. 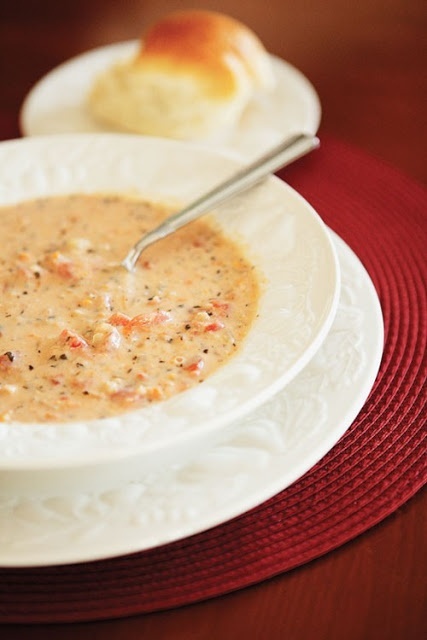 This soup, Tomato Basil Parmesan in the Slow Cooker, was outstanding. Not surprisingly, I found it on Pinterest !! It was a teeny bit of work and worth every minute spent making this delicious creation. Click here for the recipe. You can find me on Pinterest too!! Are you getting some time to sew? In case you hadn't heard, this coming September, my BFF Lynne Hagmeier (Kansas Troubles Quilters) and I will be hosting a quilting cruise along the New England coast line just in time to see the glorious colors of fall on the leaves! We're totally jazzed about this, and why not? Sound like fun? Well, it really is!! We'd love to have you join us on this week long quilting cruise as we enjoy the ports of New York City, Halifax Nova Scotia, Saint John New Brunswick, Bar Harbor Maine, Boston MA, and Newport Rhode Island. Aahhh....New England in the fall. Sounds heavenly! While we're at sea, you'll be joining us for two full days of sewing and good times. I will be teaching the Little Blue Schoolhouse pictured above. I designed the Schoolhouse block so it's easy ~ breezy, with no dreaded "Y" seams!! 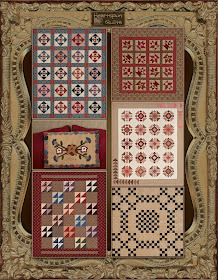 This quilt is made mostly of my fabrics from Heart of the Prairie as well as other Marcus fabrics. The kit includes the backing and binding fabrics as well. 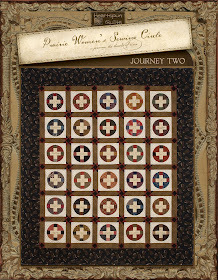 For Lynne's class, you'll be making her quilt called Twenty Five Yard Dash. 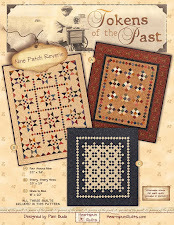 This project is super easy as well, and features, of course.....Lynne's Kansas Troubles fabrics. How can you go wrong? In addition to these two quilts, we have more special surprise projects and goodies for you as well. So...grab your hubby, and/or your best girlfriends, and join Lynne and me on our next cruising adventure! We'd sure love to have you on board with us!! It was amazing how much creativity was housed under one roof at Camp Blanding last week. These "campers" were working on everything under the sun, piecing quilts of course, working with wool, hooking rugs, applique....you name it...it was happening! Wonderful array of colors and textures with talent everywhere! ...this darling little bunny "box". Notice the rings the box has? Well, they're actually wood embroidery hoops that she glued together! How clever! 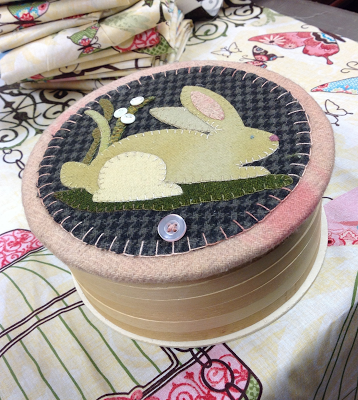 She made a lid and designed the wool bunny for her wool club. Gloria was also working on more than a few top secret projects coming soon. 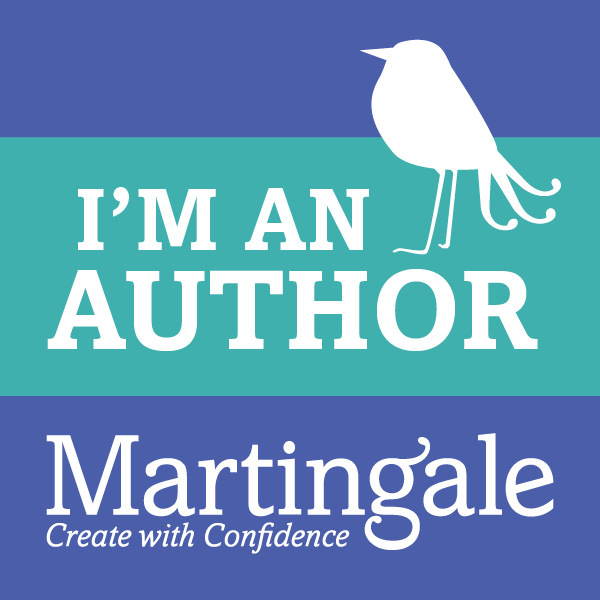 Check out Gloria's blog, Facebook page, and Pinterest boards to keep up with all that's new with my oh-so-talented friend! Sitting next to Gloria are these two talented ladies.....the women behind Red Crinoline Quilts, Paula Barnes and Mary Ellen Robison (formerly Bonnie Blue Quilts). Paula is also a fellow fabric designer at Marcus Fabrics. Paula and Mary Ellen live in different states, so when they have an opportunity to get together, they make the most of it. Mary Ellen completed this beauty, which is the new version of their pattern Sarah Emma made with Paula's new fabric collection Townhouse Gardens. How lovely is that? 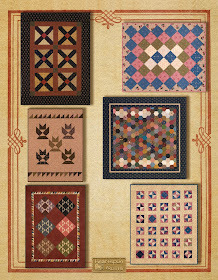 They were also working on a new quilt for Tavern Blues II. It was a work in progress, so no photos of that one.....still top secret. The biggest secret I have to keep is what's in this unassuming bin. 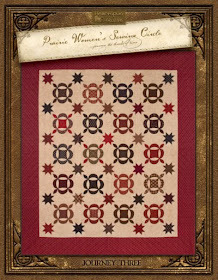 It's Red Crinoline's newest Block of the Month called Hampton Ridge. 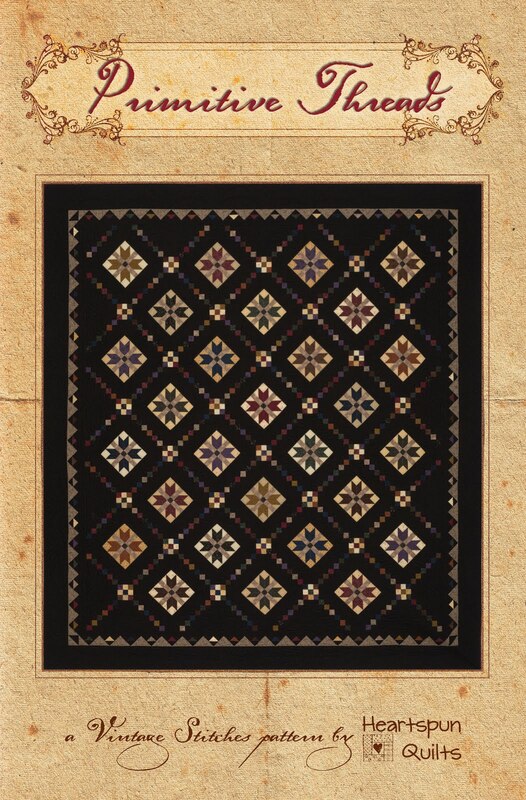 I've seen the quilt design...Oh Lordy! I'm here to tell you all to start saving your pennies, dear readers!! You're gonna want this quilt for sure! It blew my socks off!! I can hardly wait myself!! 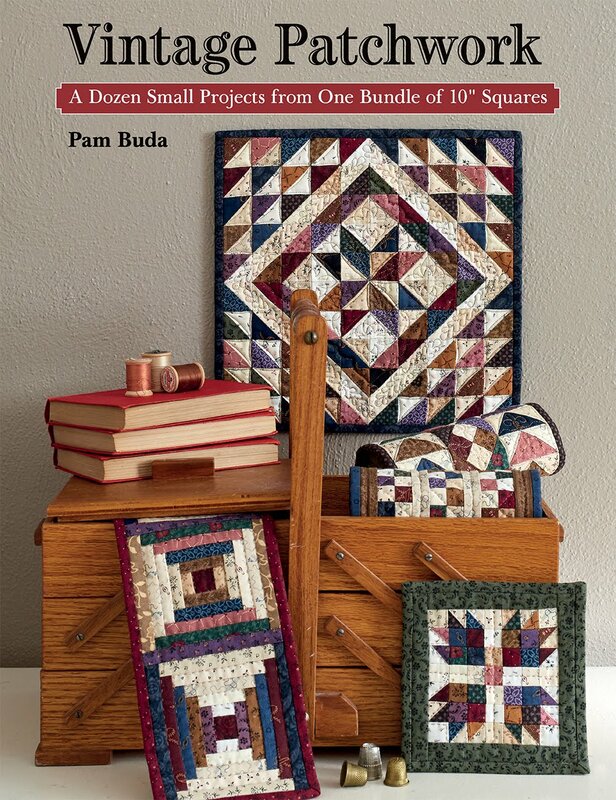 Paula and Mary Ellen tell me that the Hampton Ridge BOM will be in your local quilt shops this coming summer. There's always something new coming from Paula and Mary Ellen, and like Gloria, the best way to find all their goodies is via the Red Crinoline blog, website, Facebook page, and Pinterest boards. Well, I'd better sign off for now, I've got a few things in the works myself, and better get back to sewing. Thanks for popping in to visit with me.....enjoy your day! Here we are at the end of our Sew~Along together. Hopefully, we've used up some orphan units and lots of scraps to make something pretty and useful! Here's what I did with my blocks. I made mine into a small runner. I cut (3) 1 1/4" x 4 1/2" sashing strips to set in between the blocks. Frankly, I have lots of large table runners, but only one that was on the smaller side. My little runner measures 4" x 18 1/2" finished. If you'd like, you can make your sashing strips wider or narrow to custom fit your runner for a special place in your home. 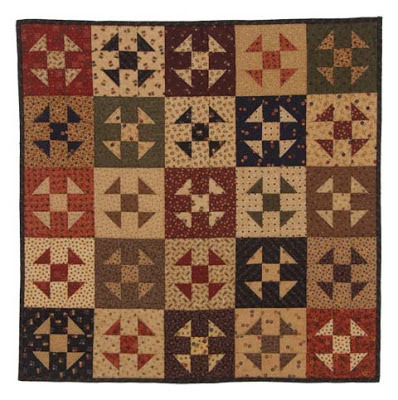 Or, even better yet, use up more orphan units....like a couple of 2 1/2" squares, quarter squares, or half squares for an interesting pieced sashing! 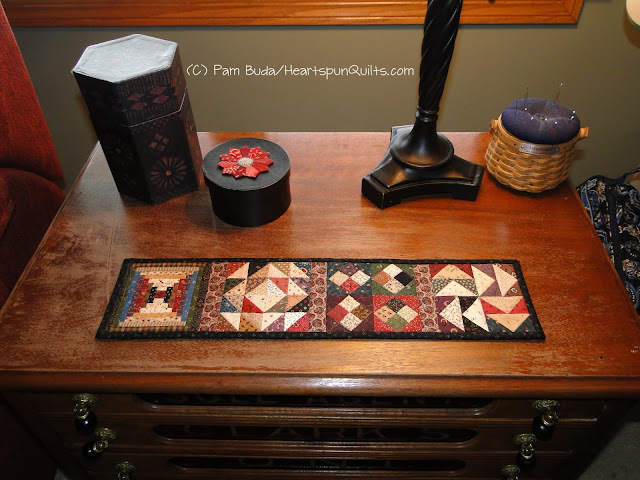 Perhaps you'll add a border or use up more scraps by piecing checkerboard sashing? Needless to say, endless possibilities! I quilted my little runner myself, stitching in the ditch here and there. I used scraps of border fabric and batting from when I trimmed my last quilt! Sometimes is really nice to make something small like this! I had the perfect spot for this runner all picked out! This old Clark's ONT spool cabinet sits next to my sewing machine in my studio. It looked naked without a little patchwork to spruce things up, so I put these blocks together just for this purpose. Don't you think it's a great way to make use of those orphan units and blocks? With it sitting next to me, I can enjoy it everyday! Even on a slightly larger surface, it looks great! 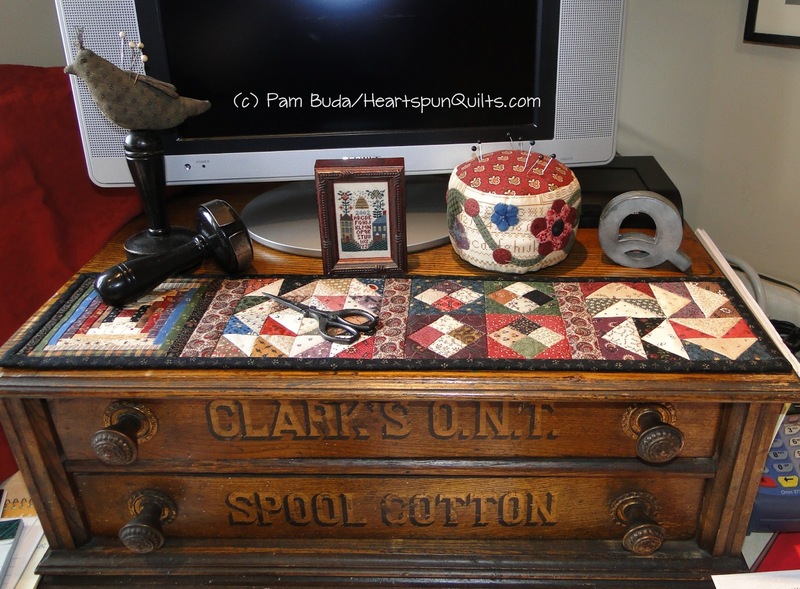 It doesn't overwhelm this spool cabinet, just adds a bit of patchwork splash. I encourage you to be creative in finishing your quilt. Perhaps a table runner isn't what you'd like. You can arrange the blocks two across and two down for a little square quilt....maybe add borders if you'd like....make it your own! Anything goes! I can hardly wait to see what you've created!! I sincerely hope you have enjoyed my Pocket Patchwork Orphan's & Scraps Sew~Along, and hope this has encouraged you to make use of those poor, lonely orphans to create something beautiful. I have thoroughly enjoyed every moment of the sew~along, and thank all of you for participating! A special thank you to everyone who commented and emailed me along the way. I know quilters from around the world have tuned in each week, and I'm excited and honored that you've all joined me!! 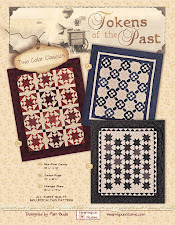 My apologies for the confusion with the photo of my Courthouse Steps block and the paper piecing template. I used an orphan block and when I chose the template, it never occured to me to check to see how many rounds it had. I was focusing on the size of the block and overlooked how many rounds there were. You can rest assured I won't make that mistake again! I'm so sorry for any inconvenience this may have caused you! I know I promised to post Part Two of my Camp Blanding retreat, but "life got in the way" yesterday, so I'll be sure to bring you that report in my next post....promise. You won't want to miss it as I'll be showing you a sneak peek from two of your favorite design teams!! Thank you all so much for sewing along with me! two more are in the planning stages! !